Bathroom Vanities and Accessories Design and Tips | DecorPlanet.com Blog: What are the best colors to paint a bathroom? When it comes to painting a wall, people are probably going to have some very different opinions about what colors are attractive and which aren't. Some people might like the idea of establishing a subtle light blue hue on the walls of a lavatory to compliment a white bathroom vanity. Others may prefer the notion of a garish neon green bathroom, simply because it makes their lives more fun. But those are two extreme examples. It's worth checking in with some experts on bathroom decor to get their insights into the subject. Speaking to Better Homes and Gardens (BHG), Bob Garder, a certified master kitchen and bathroom designer and President of the National Kitchen and Bath Association, admitted that white remains the most dominant color in the realms of toilets, sinks and bathroom walls. However, the plus side to making use of the color white is that, like black, it goes with anything. For example, the news source depicts a bathroom where the walls are painted half white and half metallic blue. In another picture, white balances out some of the kookiness of an otherwise off-green bathroom arrangement. The next bathroom BHG displays has a combination of tan walls, marble tiles and lacy tan curtains all grounded by a white bathtub. Meanwhile, the San Francisco Chronicle published an advice piece focusing on small bathrooms with limited lighting. It said that a gloomy aura could develop in a room without a lot of illumination. The mood could be offset by colors falling within a happy medium - not too "cool" to make the bathroom feel dreary or too "warm" to be aesthetically overpowering. 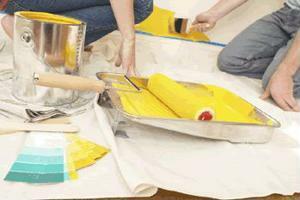 The news source lists white, pearl gray, pale pink, yellow and aqua as its highest recommended colors to paint a bathroom, while cautioning against using an excessively loud shade of yellow. Pale pink is said to "combine the best of cool and warm color effects," while pearl gray could create an air of refinement in any bathroom. Whether they're covering the wall of a bathroom or virtually any other area of the household, some colors are to be avoided outright. Apparent Therapy strongly advises against painting any wall pancake batter yellow, bubble gum pink or kelly green. Even though that's just the writer's opinion, some colors are, at least, more polarizing than others.